National reaction to Michigan's crushing 41-14 loss to Alabama on Saturday night has been slightly less brutal than I thought it would be. Oh, don't get me wrong, the Alabama-SEC love fest is already in mid-season form, but the national pundits have subscribed to a "wait and see" approach before dropping their atom bombs on Ann Arbor. I was not at the game Saturday night, I was in my suburban-Detroit home listening to Brent and Herbie talk me through what I already knew was a total massacre. Watching Alabama kill devour Michigan was madness...pure and absolute brilliant madness. Anything and everything that Michigan tried to do, especially in the first 1/3 of the game was met with a resounding "thud". Al Borges, for all of the crap that he's taken in the last 2 days had the toughest job of anyone in that stadium on Saturday night. He had the miserable task of trying to exploit mismatches that favored Michigan, where there simply were none. Run up the middle...they stuff it. Run around the outside...they stuff it. Passing was no better. Denard had his chances, and I like the play-calling in that regard, they just didn't execute. And when you're playing a team similar in talent to the Miami Dolphins, maybe better, you don't have the luxury of not executing. By the time the score was 21-0, the game was over. The scoreboard didn't tell the story of how lopsided the game had already become. Michigan had no answer. Some guys were playing well, but ALL of Alabama's guys were playing well. They looked like a team in mid-season form. And Michigan, like the majority of the Big Ten, needed a whole quarter of football to realize that the season had started. We just didn't have the luxury of playing Miami of Ohio. I'll give Michigan all the credit in the world for not giving up and actually playing somewhat well against the Tide through most of the second quarter on. I think Michigan actually put up more yards and scored more points against Alabama than all but 1 opponent last season. There were bright spots for Michigan. Dennis Norfleet looks like a natural returning kickoffs. He could be special. Hagerup averaged 51.3 yards per punt on 6 boots, that's huge. He out-kicked his coverage a couple times. There is nothing but upside for Devin Gardner playing receiver. It's very possible that against a non-NFL corner, he could do some special things. His route running could use some help, but that'll come. I thought less of Gallon when he let that punt go which was downed at the 2, it just looked like he could have grabbed the ball and gave up. But Gallon surprised me after that by making some good plays, including that 71-yard (almost TD) catch. And I be remiss if I didn't mention Big Will Campbell. He played his best football so far at Michigan against the best OL Michigan may ever face. I expect huge things out of BWC this year. Concerns? Plenty. LB's were owned. Taylor Lewan had a few very bad moments in this game, and I don't include the one where he limped off the field towards the end of the game. The penalties called on him, whether warranted or not, had an impact. Denard had a few moments when he reminded us of old Denard. Bad reads, bad field vision, bad throws, throwing off the back foot. I don't think it was nerves, he looked calm to start the game. Sophomore Blake Countess is out for the year before even finishing one quarter in the first game of the season. He tore his ACL on punt coverage in the first 5 minutes of the opening quarter. I could go on and on, but frankly, you saw the game. You know where I'm going with this. What's done is done and all that's left is for Michigan to regroup and start over this Saturday. I suspect the coaches will use much of last Saturday as a learning experience for this team. If I were a coach or player I would do that too, but I'd also spend the rest of my time forgetting that game ever happened. You must move on. Like Jordan Kovacs said in the post-game, they can't let Alabama beat then twice. The season starts this weekend. The overall takeaway: Michigan lost to one of the nation's best teams, if not the nation's best team, and although they might not have shown it they're still going to be a conference contender. 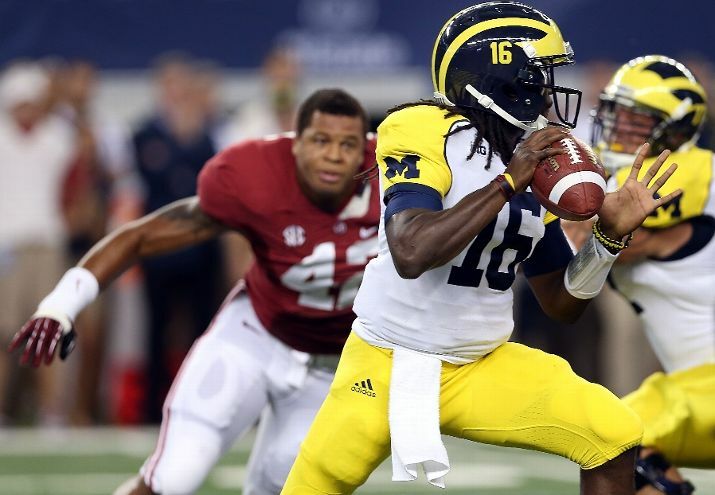 Alabama's defense is more talented and more physical than any defense Michigan will face yet Michigan's offense produced 269 yards, and that's in spite of the horrific play calling done by Al Borges. The defense struggled against the greatest offensive line it has played against in years, but who was actually expecting the Wolverine front to hold? After all is said and done this team will be right there in the thick of the conference race and be ready to redeem itself in a high-end bowl game. Expect the offense to be one of the best that the Big Ten has to offer and pray that the defensive front seven can turn things around against offensive lines that aren't totally comprised of NFL talent. So I've spent a lot of time thinking about this, and have concluded that Michigan's biggest tactical error on Saturday night was not leaving Jerryworld ten minutes into the first quarter and wandering around Dallas until they'd had enough random encounters to go up several levels. Once Michigan had unlocked special abilities like Mystic Separation and acquired the Arm Of Elway, they could have returned to the field and resumed playing on a more even basis. We find ourselves in the exclusive club section of Cowboys Stadium. We shouldn't be there, but Dan's girlfriend has that invaluable charm that renders such things moot. After a day of drinking and ignoring more basic needs, I am hungry. The concession stand offers a $13 Kobe Beef BBQ Burger, so of course I order one. I eat my burger on a marble countertop. I state unequivocally that it's the best burger I've ever eaten, and long after the beers wear off I stand by that statement. That turns out to be the highlight of my evening. An hour later, Alabama is up 21-0, and I've barely had time to get comfortable. I gaze at the field, resigned. In the second quarter, with Michigan trailing 24-0 and backed up inside their 10-yard line, Kirk Herbstreit was talking about Michigan's non-existant running game. The camera panned up to Al Borges in the coordinator's booth. After relaying the upcoming 3rd down play, Borges shook his head in disbelief and rubbed his face. It was the unmistakable look of someone who had run out of answers, like working your way through a maze and finding only brick walls. There was this ball boy for Alabama who bothered the hell out of me all game. You'd swear he wore a cologne called Arrogance. He sported the standards: visor, sweater vest over polo, Beatles haircut. Your textbook SEC schmo. The entire game he would scour the crowd with a look I can't even describe; almost a blank stare, but with enough curvature in his mouth to know it was a smirk. He kept surveying the crowd too. I had no idea what he was looking at, but he'd just stare up into the crowd with that same look on his face for the entirety of the game. What's sad is that I think we were thinking the same thing: Alabama was going to win this game and we both knew it before the game started. Last night's game was bad. I completely understand, but that doesn't mean Michigan football is dead or needs to "go back" to its old ways because frankly, those ways didn't get the results that people are demanding of this team. Alabama is a deep, experienced, and well-coached team that has been filling its roster with over-signing for years. We don't even need to mention the 2 national titles in the last 3 years. They're very good and I'm not even sure how many of Lloyd Carr's "Michigan" teams would have been able to beat them. I don't think I need to mention the last time Michigan was in the Rose Bowl and lost 32-18 against USC.